For a little over three years, I’ve been working as a freelance writer (plus, its other permutations, including hand-holding temperamental art directors) and I love it (not the hand-holding part so much). I love it that I still get to do what I love without having to go to an office and report to work. I love it that when I wake up I don’t have to immediately jump in the shower, groan that I don’t have anything to wear, and brave the rush-hour madness in the train. (I can just have my breakfast and start working in my pajamas, thank you very much!) I love it that I can often write about different things that matter to me. Not all the time, but often enough. (As long as they don’t run counter to my principles, I’m on it. After all, there are bills to pay. ) I love it that there are days when I simply spend it cooped inside the house (or in the case of this weekend, inside a hotel function room next to a buffet spread, while proofreading a manuscript…hmm, buffet). I especially love it when I get to travel to places I wouldn’t have otherwise visited on my own, because they’re not on any tourist map or most people’s travel radar. Last year, I got to be part of a team that had to travel all over the country for a corporate project on different bodies of water and how they contribute to the town’s livelihood or development. Since the Philippines is an archipelago, there was a lot of ground, er water, to cover. While the two-month long itinerary included trips to tourist-friendly spots such as the islands of Coron, the beaches of El Nido and Caramoan, Sumilon Island in Cebu, the surfing town of Baler, and the university town of Dumaguete, among others, we also had to visit small lakeside rural towns, a couple of middle-of-nowhere sites, and some remote areas near terrorist territory. And we had to travel during the monsoon season. And it involved a lot of boat rides. And I didn’t know how to swim yet. It was thrilling and terrifying at the same time. It had all the ingredients of a remarkable adventure that often pushed me out of my comfort zone. 1. Camarines Sur. Before we headed to Caramoan, we had to go to Lake Manapao in Buhi, where the you can find one of the smallest edible fish in the world, a goby locally called sinarapan. 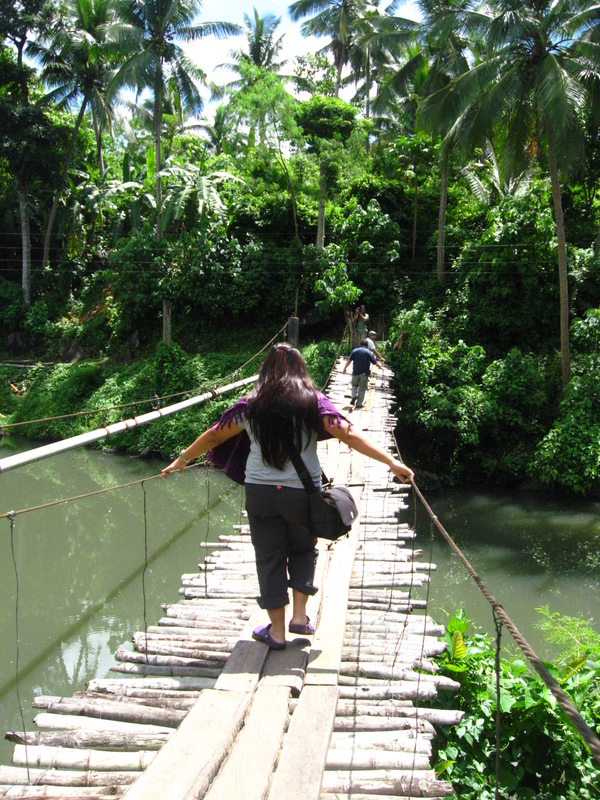 One of the things we had to do to get to the lake was cross this hanging bridge. I am not afraid of heights, I like riding big ferris wheels and standing atop tall buildings, but for some reason I turn into a wimp when it comes to hanging bridges. First, it wasn’t the most sturdy looking bridge and it didn’t help that my companions thought it would be funny to sway it from side to side. Not funny, but at least it didn’t make me retch or wonder whether I was going to make it out of there alive. 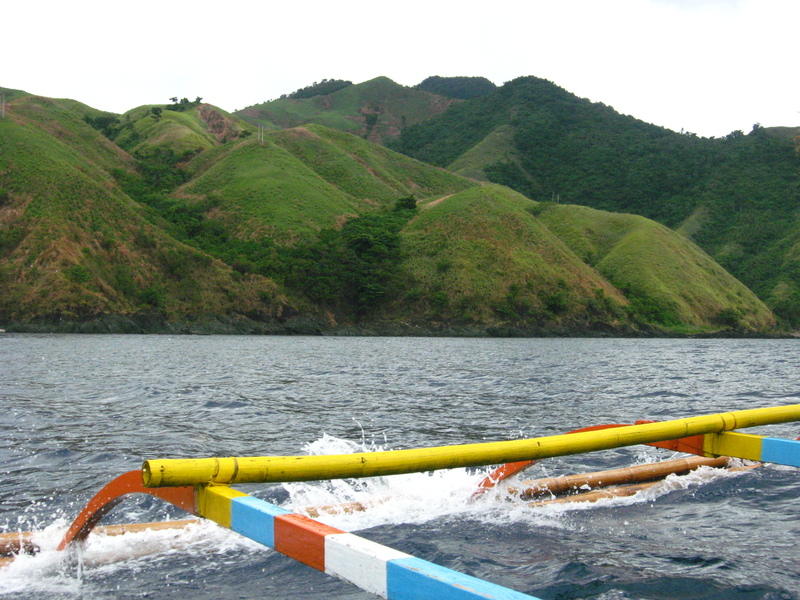 That honor belonged to the terrifying two-hour boat ride we took from Caramoan back to Sabang. Because I like to write things down. Hi, I'm Mabel. Welcome to slouching somewhere! This is a space where I share my stories about travel and home, food and family, and other things in between. Thanks for reading! Goodbye summer, hello fire trees!